Two of the three bones of contention: The old houses on Friday afternoon. The Oregon Land Use Board of Appeals, in a decision filed Thursday, “remanded” or sent the case back to the city for, presumably, additional proceedings. LUBA said the Albany council failed to adopt findings to support its decision, which was to allow the demolition after 90 days. The state board also said Councilman Rich Kellum was biased on the side of demolition, citing a comment he had submitted to hh-today. The council voted 4-2 on Oct. 10 to allow the houses to be taken down after 90 days. Albany resident Bernadette Niederer, a former official of the Monteith Historical Society, appealed that decision to LUBA. The council acted after the Landmarks Advisory Commission, in September, had stayed until this coming July 9, or 365 days after the application was filed. The Albany code says that this was all the Landmarks board was allowed to do, rather than denying it altogether. LUBA, though, said Albany’s code fails to comply with a state administrative rule, which does indeed allow for the complete denial of a request to demolish a “contributing” historic landmark unless certain conditions are met. The houses have suffered from decades of neglect and abuse. The city boarded them up and evicted the occupants in 2017. Albany homebuilders Mark and Tina Siegner bought the single tax lot containing the three structures from the Signs of Victory Mission in February 2018. 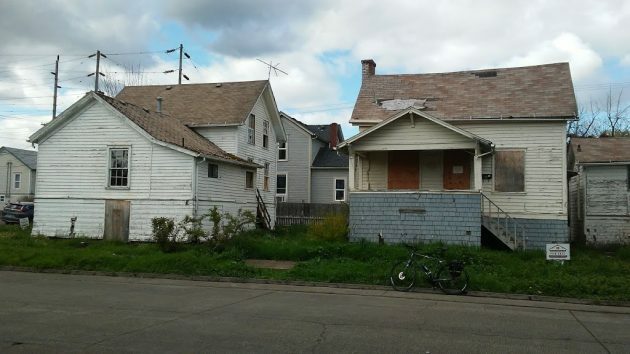 After they determined the houses could not be economically restored, they sought city permission to clear the lot so they could build new housing that blends with the historic neighborhood, as they’ve done elsewhere in old Albany. It is a sign of our times that three un-elected political appointees decide land use appeals instead of nonpartisan elected circuit court judges. Welcome to the administrative state –an undemocratic form of government where a few elites impose their will over an individual’s private property. The creation of such power is the definition of bad government. I don’t follow your train of thought. The “unelected ” turned the matter back to the “elected” Albany City Council. Seems appropriate. When a citizen thinks they have been harmed by another citizen’s land use, the issue should be decided by a court of law. The judge will look at compliance with the law and any contractual obligations that apply before issuing a decision. An administrative body like LUBA should have no power and play no role. The legislative bodies (state and city council) should play no role other than to advise the court on the intent of applicable laws and the status of recorded contracts. And only citizens with standing should have the right to complain to a court. But yet today anybody for any reason can spend a few hundred bucks and file a complaint with an un-elected politically appointed body on any land use issue. And that un-elected politically appointed body can impose their will on the owner of the private property. This is freedom in our democratic republic? No, this is bad government. You make strong points. I spent some time on State websites to review some landuse planning history. LCDC came to be in 1973 to establish rules for planning and oversee local plans. It also ruled on appeals from lower jurisdictions. LUBA came to be in 1979 to provide judiciary review of land use appeals. The three members must be Oregon Bar members. So, LUBA is a specialized court with narrow jurisdiction. Effectively, all State judges are appointed. You need to do a little more research. Land use issues are local, not state. So in an ideal world any dispute would go before the Circuit Court. And they are nonpartisan and elected. Admit it, sending a land use issue to an un-elected politically appointed administrative body in Salem is undemocratic. A brief civics lesson . Circuit Court is part of the State judiciary. Vacancies ate filled by appointment by the Governor for a specific term. Renewal is subject to local vote. LUBA is a specialized court that is intended to settle differences that aren’t being resolved at the local level. It is not an administrative body. This is great news for residents of Albany’s Ward III. Thanks to one of our City Councilor’s incessant need for public affirmation (demonstrated by ill-chosen words published for all to see) the residents of Ward III will no longer have any input on this issue. This same Councilor often speaks prior to thoughtful review, but this time, this Councilor’s poorly planned output is causing Ward III constituents to be without their duly-elected voice. Perhaps the offending Councilor could learn to hold back on commenting publicly on ongoing matters. The precident every other historic home owner has to follow seemed to have been lifted for the folks who bought this lot, it could be the buyer had been encouraged to buy it with an interpersonal insurance policy such as i will see what i can do sort of thing to slip this tax lot out from under the historic preview. The owner says they are too costly to rework. That simply means the return on his investment will take longer to realize a profit. By the Commenter’s analysis, the regulatory burden makes it not profitable enough to rehab These Old Houses to fit the fantasy of unelected commissions. Apparently the Commenter believes that the owners should wait as long as it takes to realize whatever profit might or might not appear after this lengthy round of governmental overreach. Can the owners hold on long enough to realize a reasonable profit, or should they accept that faceless commissions with no skin in the game are the arbiters of their bank accounts.